Detroit Red Wings Forwards: Who’s on the Bubble? Detroit Red Wings training camp kicks off in just under a month ,and the organization may arrive in Traverse City with a plethora of forwards ready to compete for an NHL job. 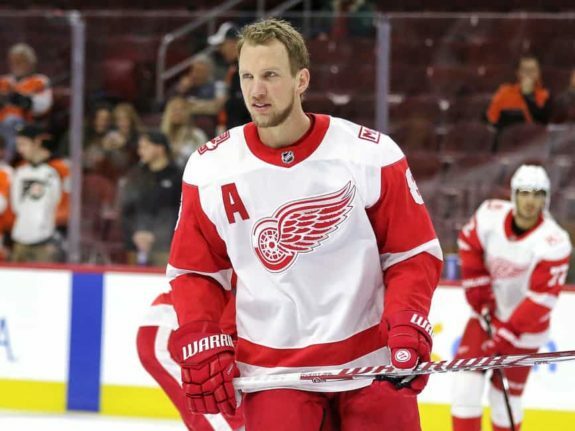 Injuries can (and frequently do) occur over the course of training camp and the preseason, which could force Holland and Blashill’s hand on doling out roster spots. Trades are not out of the question either. Regardless, a healthy, open competition for ice time would be beneficial for an organization trying to up its compete level from a lackluster previous season. Let’s take a look at the 18 candidates who will be pushing for ice time in Detroit once the regular season kicks off. 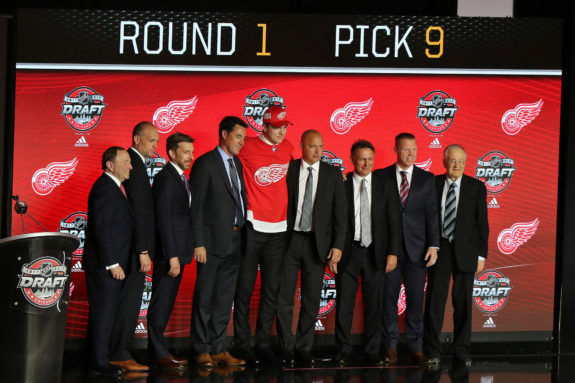 At the center of Detroit’s rebuild are Dylan Larkin and Anthony Mantha. The two have developed into every-night offensive threats and could take another step forward during the 2018-19 season. In addition, you can pencil in Justin Abdelkader, Tyler Bertuzzi, Frans Nielsen, and Thomas Vanek for opening-night roster spots. After an impressive half-season with the Red Wings, Bertuzzi cannot be sent down to Grand Rapids without passing through waivers first. He’s a full-time Detroiter now, as are Abdelkader and Nielsen, each of whom Jeff Blashill values for their defensive reliability. The two also have nearly immovable contracts that will keep them around for some time. Additionally, when the Red Wings brought in Vanek this summer, they did so because of his mentoring abilities and offensive zone prowess. He’s a lock given his recently signed contract and no-trade clause. Henrik Zetterberg is only listed in this category because of his uncertain status – he’s clearly going to play for the Wings if he returns, but that’s not a given at this point. The others are near locks to be in the opening-night lineup but also possess some trade value. 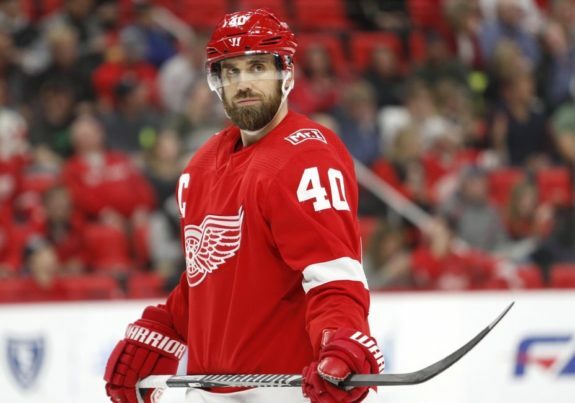 In case Zetterberg is able to gut out another season, the Red Wings will need to cut some salary to become compliant with the salary cap’s upper limit. Athanasiou, Glendening, Helm, and Nyquist have all been rumored to be on the move before, so their status is slightly up in the air. In all likelihood, Zetterberg will not be able to play this season and will subsequently be placed on long-term injured reserve, and the rest will be in the lineup versus Columbus on Oct. 4, as no additional salary would need to be cut. Here’s where it gets interesting. With 10-11 spots in the lineup claimed, only a player or two can join them and another one or two others can be kept as healthy scratches to compete for playing time. Of the seven players listed, Michael Rasmussen has the best shot at sticking with the Red Wings. Though he can be sent back to juniors for another year, it would be in Detroit’s best interest to play him in the lineup every night. That’s one spot claimed. After graduating in May, David Pope is an unlikely candidate to make the Wings, but an impressive training camp could change that. His strong shot and size would be appreciated in Detroit. Evgeny Svechnikov and Dominic Turgeon can be sent down to Grand Rapids without having to pass through waivers. In the past, Holland has used this to his advantage, though the new preferential treatment toward younger players could dissuade him from making that move again. Both Svechnikov and Turgeon should factor into Detroit’s future, and offer differing skill sets. One-dimensional wingers Martin Frk and Luke Witkowski seem like good healthy-scratch candidates if the Red Wings keep 14 forwards on the roster. Blashill likes Witkowski’s ability to play offense and defense despite playing a grinding style and not adding much else. Add in his his low cap hit and the Holland, Michigan-native may have the inside track to earn a spot on the roster. Similarly, Frk’s shot can be an asset, but how much ice time would he see to deploy it? Finally, the Red Wings will give Filip Zadina every chance to open the season in a middle-six role with the NHL squad after selecting him sixth overall in June’s draft. They’re going to look out for his long-term best interests though, so spending some time in Grand Rapids to develop may not be the worst option. Plus, playing in the AHL wouldn’t burn a year from his entry-level contract. Which Detroit Red Wings bubble players will make the roster? Share your predictions below.